« Lawn care business sales procedures. There are improvements you can make on your estimating and sales presentation that can improve your ability to sell. Some people naturally seem to excel at sales because of their extrovert nature while others who may be introverted have a difficult time being outgoing. 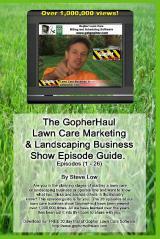 In this discussion from the Gopher Lawn Care Business Forum, we see simple easy to follow steps you can take that will help you make more sales and make more money. One lawn care business owner wrote “sending out a thank you letter after you bid is an easy step any landscaper can take to improve their chances of success. I think it is always better to send a letter after you bid, because you don’t want the client to feel pressured. This is more of just a simple thank you, for giving us the opportunity to bid, with maybe a short inference to scheduling the job. When you call the client back within 24 hours of a bid, it sounds a lot more like you are trying to make a hard sell. Ideally you want to have already met the client in person twice before you send the thank you letter. Once to assess the project, and again to deliver the proposal. The thank you letter after completion is, short simple and to the point. I just have a template on my computer where I can plug in the clients address and send it off. I do not recommend calling the client and following up if it is a regular mowing client after every mowing. Just send them a thank you letter at the end of the season. If it is just mowing I give the customer the quote on the spot if they are home. If it is more than mowing and I need to figure material costs etc. I set up a time to deliver the proposal. The point is to require the client to meet you in person when you give the proposal, whether it is right then or at a second date, but do not give the client the estimate over the phone, or through the mail. If it’s a commercial client and they want the bid mailed, or whatever, I just do whatever they ask. Commercial bids are so cut throat that you want to do everything under the sun to oblige anything they ask when giving a bid. On the residential I just give them the bid and let them review it, then ask if they have any questions. The whole purpose of delivering it in person is the presentation. Here is a sales scenario: I show up at the prospect’s home. My truck is clean. I am dressed well and professional. I take my time assessing the property and write up a professional proposal and leave it on the door for when they get home. Another guy shows up to give a competing bid. They drive up with a truck that is rattling, the fenders are about to fall off. They stumble out of the door with a cigarette hanging out of their mouth, beer on their breath, and their shirt undone. But you know what? They write up a proposal and leave it also. When the client gets home what do they see? Two pieces of paper and they will go on price every single time instead of value. 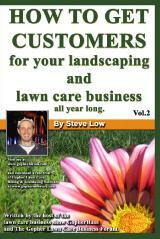 Order the book Lawn Care Business Bidding Tips, Upsells, And Disasters To Avoid. today. This entry was posted on Friday, January 25th, 2013 at 5:39 pm	and is filed under How to Estimate - Services To Offer, How to Estimate Jobs, How to get, How to sell, Landscape Project, Landscaping Business, Lawn Care Business, Lawn Care Business Sales Letter, Lawn Care Customers, Lawn Care Marketing, Marketing, Mowing. You can follow any responses to this entry through the RSS 2.0 feed. You can leave a response, or trackback from your own site.